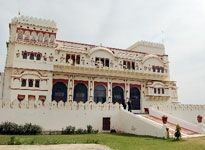 Ideal for any historian, nonetheless, Surajgarh holds equal appeal for nature lovers and casual observers alike, with its magnificent forts and palaces. Hotels in Surajgarh have come up with a helping hand. Hospitality in its highest form is rendered by the Hotels in Surajgarh. With a foresight to see the basic requirements of its guests, the Hotels in Surajgarh serves guests with maximum care and concern. Basic amenities like lighting, attached bath, television and telephone is provided with each room that you select. The efficient services delivered by travel desk at Hotels in Surajgarh suffice the discerning need of a traveler. In case you are a shopping buff, then come and see for yourself, the sparkling bangles, radiant ear-rings, gleaming necklaces and glossy rings at Surajgarh Shopping Complex. Moreover the painted forts, Khetri Fort, with their unparallel charm, continue to allure tourists from way off countries. You can also enjoy the Camel Cart Rides and local Bawari Picnics (beside water tanks). All these jointly make your tour to Surajgarh an invigorating experience.